Search for all "LGR4 / GPR48"
Mouse anti Human LGR4 / GPR48 OTI5B8. 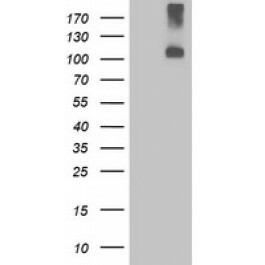 Product is tested for Flow Cytometry, Western blot / Immunoblot. 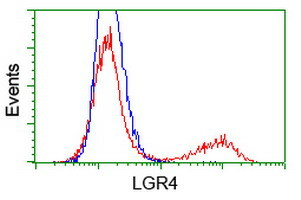 Human recombinant protein fragment corresponding to amino acids 230-540 of human LGR4 (NP_060960 ) produced in HEK293T Cell. G protein-coupled receptors (GPCRs) play key roles in a variety of physiologic functions. Members of the leucine-rich GPCR (LGR) family, such as GPR48, have multiple N-termil leucine-rich repeats (LRRs) and a 7-transmembrane domain (Weng et al., 2008 [PubMed 18424556]). [supplied by OMIM].